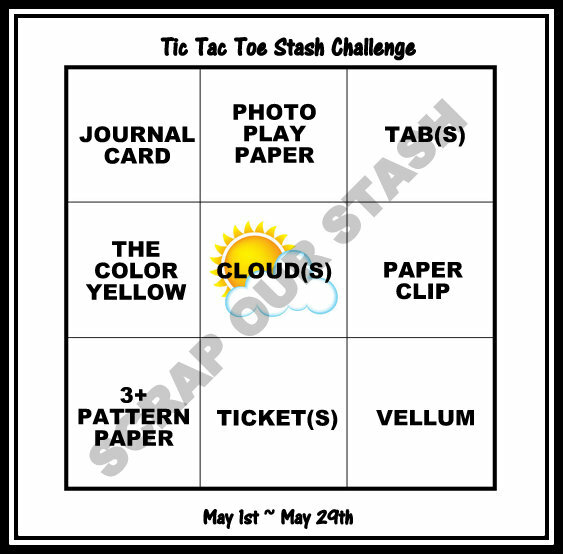 I used a journaling card, made some little clouds, and played with my vellum. I used gold gelato and a brick-like stencil on the vellum for a little background behind the title and journaling area. I like how it looks! Also used my new Creative Memories Button punch, which punches three different sizes and shapes of button. I love it! Great job using all those photos on one page. Nice idea to use a brick stencil on the vellum. It works perfectly for the subject of your page. TFS. 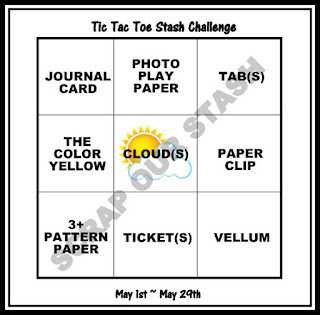 I love the gold brick!Great take on the challenge!Thank you for joining us at Scrap Our Stash! What a fantastic page. Love details and stash use. Thanks for your entry in our SOS challenge. Looks like a fantastic place to visit!I'm loving the yellow and the texture on the vellum is cool :) Thank you for Tic Tac Toeing with us at Scrap Our Stash! Awesome page! Thanks for participating with us at Scrap Our Stash! Beautiful layout, great take on the challenge! Glad you joined us at Scrap Our Stash!